Aitor Ormaetxea is managing director of the hot-forming division of Fagor Arrasate S. Coop., Gipuzkoa, Spain; www.fagorarrasate.com. Hot-forming (or press-hardening) technology continues to play a growing role in the stamping of structural automotive parts from advanced high-strength steels (AHSS). For example, automotive suppliers forming boron-alloyed steels heat blanks to 900 C prior to forming, to achieve a fully austenitic state. The heated blanks then remain in the press with the die (water-cooled) closed until the steel temperature drops to 150 C. This process yields a fully martensitic steel with a tensile strength in the neighborhood of 1500 MPA or more. A servo-mechanical press serves as the heart of a hot-stamping installation at Batz, a European automotive-parts supplier. The installation has demonstrated significant energy savings and improvements in part quality, according to Batz officials. A critical success factor during hot stamping is the ability of the press to keep the die closed during the cooling process, requiring the slide to stop and stay at bottom dead center (BDC). Here’s where the unique capabilities of servo-mechanical presses shine—in particular the ability to provide force control even while the ram remains stationary. Much work has been done in recent years to evaluate the force stability of servo-mechanical presses at BDC, as well as motor-torque performance and the required restarting torque. These findings verify that press conditions at BDC are well suited to a continuous hot-stamping process, with the required control of ram position and force on the part and die without a measurable increase in power consumption. 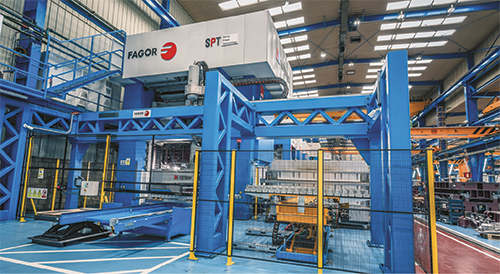 While hydraulic presses originally got the call for hot-stamping lines, the Spanish automotive supplier Batz can testify to the benefits provided by servo-mechanical presses. It has used a 15,000-kN Fagor servo-mechanical press (3.6 by 2-m bed) for hot stamping since March 2016—for die tryout and production. The company uses hot stamping to produce primarily safety-related parts from boron steels, and employs production lines outfitted with robotic destackers, roller or walking-beam furnaces, robotic unloading to conveyors, and laser or press trimming. With two years under its belt using the servo-mechanical press in hot-stamping die set-up and preserial production, Batz now has a clear idea as to press performance in this application. Energy savings was an immediately identified result. More surprising was the equipment’s effect on part quality. Alonso advises that proper training is necessary to gain the full advantages of this hot-stamping technology, a lesson learned during Batz’s adoption of the new equipment.